Published on 9 November 2012. This is Whistlestop. Or to give it its full name, Whistlestop Foodwine. So fast are they moving that they can’t even pause for an “and”. 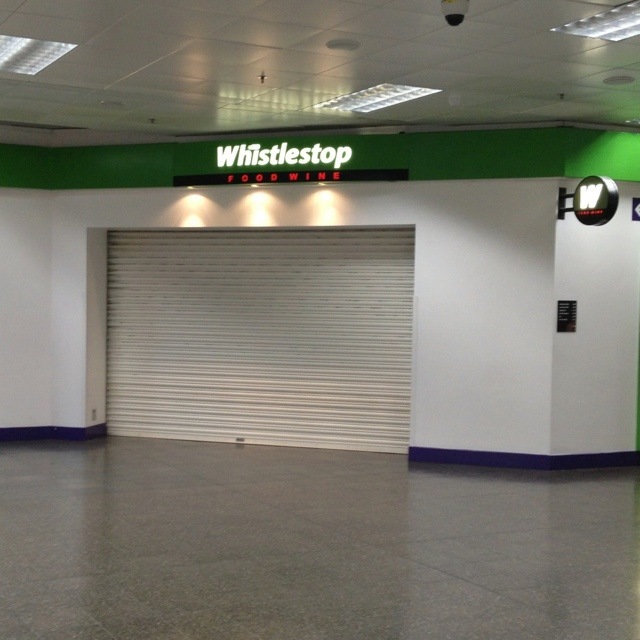 Whistlestop is the shop right next to the domestic arrivals area at Newcastle airport. It markets itself as ideal for picking up some bread, milk, or other sundries on return from one’s travels. The bizarre thing about this proposition is that in all the time I’ve been a regular user of this airport, I think I’ve only seen it open once. It seems to have absurdly restricted opening hours. Now forgive me, but I would’ve thought that a shop like this would cash in on, for example, travellers who return on a Sunday night and need supplies for the following morning. Other shops are frequently closed, so this small store could cash in. Except it’s not open. Which begs the question… what is its market?! It’s been here for years, so it must be doing something right! This 1,883rd post was filed under: Photo-a-day 2012, Newcastle-upon-Tyne, Public Transport, Retail.